Do you have a rug that’s been passed down through the generations? Perhaps all of that time has taken its toll, and the effects have begun to show. Or maybe you simply have a cherished piece that just fits perfectly in your living room. 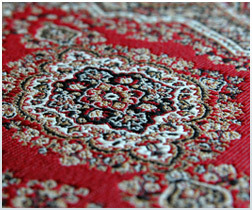 Whatever kind of rug you have, our technicians can expertly clean and restore it. We handle all kinds of rugs, from Oriental handcrafted heirlooms to machine made synthetic pieces. Trust us to get your rug back in shape. The steps we take depend on the origin, material, and type of your specific rug. From the moment we pick up your rug to the moment we drop it back off, you’ll feel secure knowing that your rug is in the hands of specialists trained specifically to handle this kind of job. Pick Up: We’ll pick up your rug free of charge anywhere in the tri-state area. Preparation: Our first step is to thoroughly examine every square inch of your rug. We’ll take special note of discolorations, stains, and wear to make sure that we deliver you a rug that is as magnificent as the day you purchased it. Pre-Treatment: The next step is an extremely gentle application of a vacuum to the rug’s surface. This removes all loose particles, but is really just the beginning of the cleaning. We’ll also use a cleaning solution to begin to break down any stains. Grooming and Combing: Next, we’ll groom the rug, restoring it to its former glory. We’ll also comb the fringe to strengthen its integrity. Drying: Finally, we set aside your rug in a climate-controlled room, making sure the transition from wet to dry is gentle enough to ensure no damage is done. Delivery: Once the rug is dry, we’ll carefully load it onto one of our trucks and deliver it right to your doorstep. Sometimes, your rug needs a little bit of extra attention. We have trained technicians who specialize in repairing damage, including hole patching, corner restoration, and fabric repair. Give us a call today to find out how we can bring your rug back to life. We offer you a No-Obligation Free Estimate from one of our friendly technicians at your convenience. Fill this online form or simply call us now at (866) 380-4987. We do not share any customer's personal information. Copyright © 2019 newyorkerscarpetcleaners.com. All Rights Reserved.